Lexus says the LF-Ch concept is a response to the growing demand for cars that are smaller and more fuel-efficient. LOS ANGELES -- Lexus division General Manager Mark Templin said today that he thinks the LF-Ch hybrid concept should be turned into a production vehicle and sold in the United States. 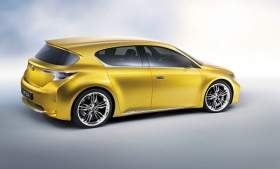 The rear-drive, five-door hatchback debuted at the Frankfurt motor show in September. If approved for production, the compact car would compete with such premium models as the BMW 1 series and Audi A3. Lexus said the concept is a response to the growing demand -- particularly from young urbanites -- for cars that are smaller and more fuel-efficient. "We're showing it in North America to see if it can compete," Templin said. "I feel good about it. We'll survey people to see how they feel about it. I would love to see this car in the U.S."
Templin did not say when Lexus would decide, but he said the brand would be the first with a dedicated hybrid in the compact-luxury segment. "I think it would make a great youth play for Lexus," he said. "It would bring new customers to Lexus." The LF-Ch concept was designed by Calty Design Research Inc., Toyota's North American-based research and design center in Newport Beach, Calif.